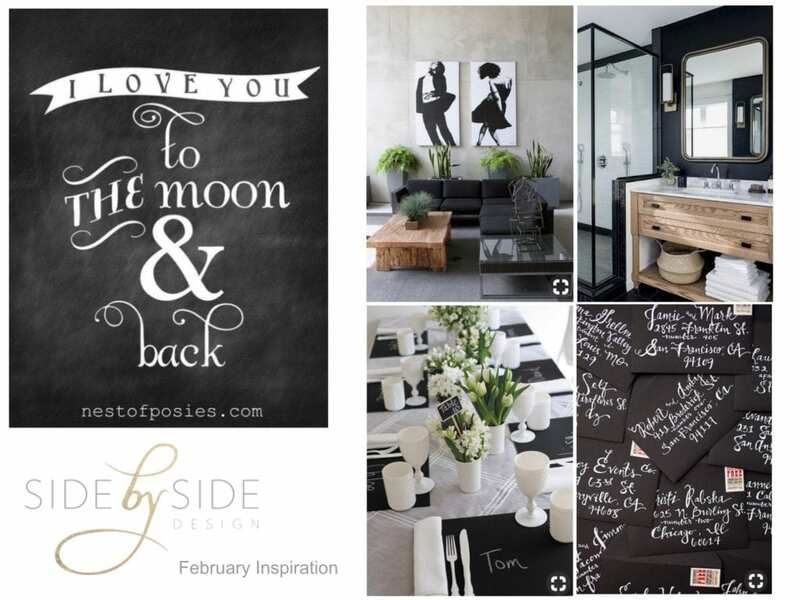 Tami’s inspired: I love that it has become our tradition to celebrate Valentine’s Day at home. This year won’t just be me and Phil, but Joie too … So I have been thinking of ways to incorporate her into the plan. I haven’t quite figured it all out yet (and Phil let me know he wants to do the cooking this year), but I do know that I would love to figure out a way to show these two that “I love them to the moon and back”! Any way, whatever we end up doing, or however I piece together some cute decor, it will be nice to take a break to be with those I love. What’s my designer tip this month? Pick a color scheme you love to the moon and back! Whether it be our two favorite colors (black + white) or your own combinations, it’s what you see every day, so make sure it suits you. I love incorporating black and white into almost everything but especially love finding new ways to do so. These milk glass wine glasses are everything and so is a black wall when done right. This black and white art is stunning, and these invitations are finished off just right! Lauren’s inspired: This is still one of my absolute favorite photos (taken of my little flower girls at Tami’s wedding.) These girls inspire me every day, and I can’t believe at the end of this month Cara and Sienna are going to be three. It is one of the coolest things I have ever experienced to see my twins grow up, build their bond, and remind me each and every day of me and my own twin sister. Obviously this month we’ll be busy celebrating, but we also have some awesome collaborations in the works that I am super excited about, and the continuous events and celebrations keep on going this month too. What’s my designer tip this month? It’s never too early to start preparing for Spring! Adding some flowers into my space (even when it won’t stop raining) makes me very happy. Mix up your pillow game, and switch out your accessories. You can create this look in your events as well really any time of year indoors or out (if the weather permits). It automatically brings a cheerfulness and can trick your mind to think that it’s warmer than it is. 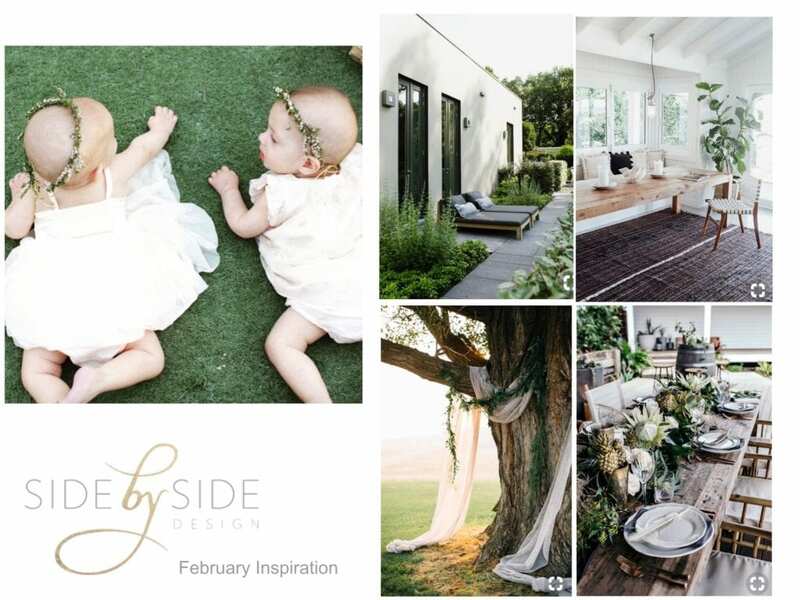 Here at Side by Side Design, we look forward to an exciting month including a look at how each of us set up for Valentine’s Day last year, details from our Sweets and Sunflowers Bat Mitzvah party and another event with an ultra fun theme, updates on Lauren’s many interior projects, and more! Don’t forget to check out our next Get Inspired post on March 1st for all new looks and inspiration! Also, check out our new Instastories feature “Designer Day!” @sidebysidedesign to see how we fill our days with the things we love.